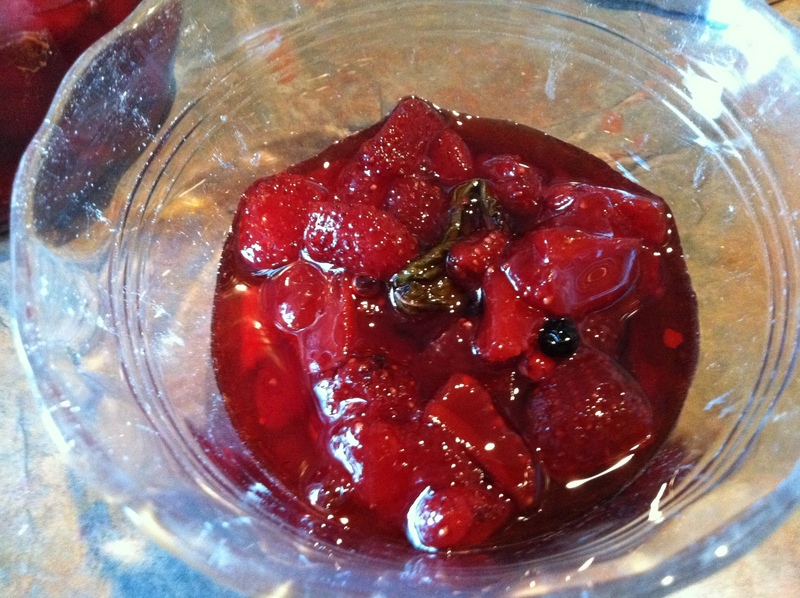 I found this recipe online Confiture de Fraises au Poivre Noir et la Menthe Fraiche (it sounds VERY fancy). Earlier this summer, we had volunteer strawberries and were getting strawberries in our CSA boxes as well, so I thought I would try it. But, I have never made jam before, so this was a whole new adventure. Since I am new to jam, I intended not to bastardize too much, figuring that following the instructions might help…. But apparently I am unable to follow instructions. I didn’t have the crystallized sugar called for, so I used granulated, but not as much as she called for, because I didn’t want it to be too sweet. Also, I wanted the pepper and mint flavors to come through so I used more peppercorns (15) and more mint (using whole sprigs instead of individual leaves). – My mint garden is another whole story….. I cross referenced with another jam recipe, and since this recipe didn’t have any thickening agent, I added a packet of unflavored Knox gelatin, thinking this would help it set up. I also don’t have a candy thermometer, so I tried to test the doneness by dropping jam onto the frozen saucer, and it seemed to be about right. I really did follow the instructions on canning the jam, put in in the fridge and left home for a week, figuring it would be set up when I got home…. Wrong. It is more like a chunky syrup. The flavor is fabulous! Fresh strawberry chunks, with the mint and a little heat from the peppercorns. It seems very sophisticated, but that may be the long french name that puts me in that frame of mind! It is still very sweet. We’ve eaten it on biscuits and on french toast, and it would be yummy on top of ice cream as well, in its runny state. I will try it again, and appreciate any ideas you might have on how to get it to set up better next time. 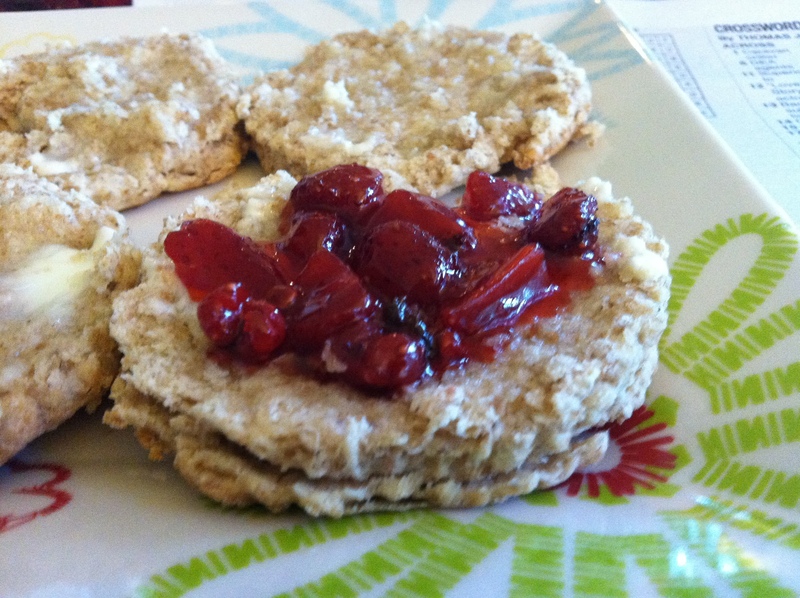 This entry was posted in Recipes and tagged jam, mint, peppercorn, strawberry. Bookmark the permalink. I would try placing some of this jam into plastic containers and freezing it. I don’t know much about making regular jam but I’ve got freezer jam down to a science. After this post was up, we also thought about putting it on oatmeal too. I might have to try that in the morning. Thank you! I will definitely look for Pomona’s and try this again. I’ll let you know how it goes. Thank you all for your help. My next attempt, jelly this time, was much improved based on your input.